It has been awhile since I even touched a romance novel, but I couldn’t resist. Kathleen E. Woodiwiss quickly became one of my favorite romance authors years ago when I was in my romance phase. I’m still drawn to her books and after reading this one have considered going back and rereading some others. Woodiwiss redefined the historical romance genre, and every single book of hers I’ve read has become and instant favorite. This one is no different, and I ate it up very quickly. It’s hard to put down any of her books. I will say that for awhile I thought a couple details were glossed over or forgotten but the author picked them back up later, to which I was relieved. I hate when details are mentioned and then never referred to again. In the end, the guys get the girls, some of them are pregnant, and everybody lives happily ever after. Such is the bumpy road of romance novels. I’m sure we all know The Jungle Book, which Disney has made so popular with it’s rendition (although it does not follow the book, but the basics are there), but…there is more in this book than what Disney portrays. The Jungle Books does include the story of Mowgli and his eventual return to mankind, but it also includes the tale of Kotick, the white seal, Rikki-tikki-tavi, the mongoose, Little Toomai of the Elephants, and the animals of the Amir’s parade. Each is interesting in their own way and Rudyard Kipling does indeed know how to tell a tale which makes them all the more enjoyable. I made the mistake of watching the newest Beowulf movie (the CGI one) before reading the epic poem that is Beowulf. First, Beolwulf was originally written in Old English, which reads much different from Modern English. Therefore, one has to read between the lines to fully comprehend the action and adventure of this story. And it does not follow the movie exactly. There will be spoilers, so stop reading here if you wish. One: Beowulf comes across the sea to defeat Grendal. Two: He defeats Grendal, the kingdom celebrates, stories are told, and gifts are lavished upon Beowulf. Three: Grendal’s Mother wreaks havoc because her offspring is murdered. Four: Beowulf again becomes the hero, but loses the sword Hrunting in the cave. Five: Again there is much rejoicing, storytelling and gifting. Six: Beowulf returns home, and eventually becomes the heir to his home kingdom. Seven: A random peasant robs a dragon of a gold cup, dragon wreaks havoc on Beowulf’s kingdom. Eight: Beowulf dies slaying the dragon and leaves Wilfgar in charge. Nine: Beowfulf is burned on a funeral pyre and is praised and celebrated. Much different from the movie, basically an ode to great Beowulf, not really a story, but still good if you like that kind of thing. Definitely a classic old tale. Everyone loves a good ghost story. Perhaps the human fascination with the supernatural stems from the fact that most of us, at some point in our lives, have experienced something we couldn’t quite explain. From a very young age James Van Praagh was aware of a dimension that most of us cannot see, and he has dedicated his life to explaining it to the rest of us. Ghosts Among Us takes us on an incredible journey into the spirit world that brings to light one of our greatest mysteries—what happens to us after we die? Van Praagh, the New York Times bestselling author and co-executive producer of the CBS series The Ghost Whisperer, shares his knowledge and life experience about ghosts, a subject that can seem to many of us both bizarre and terrifying. But when the world beyond is explained fully by an experienced guide, dismissal and apprehension can be turned into knowledge and inspiration. With incredible true ghost stories and surprising details about how ghosts actively participate in our lives, Van Praagh challenges us to question our perceptions and shows us how we can live more fully through understanding the world of spirits. Including eerily accurate readings, the author’s development as a medium, and detailed how-to information, Ghosts Among Us is an all-encompassing guide to the supernatural. Gavin Guile is the Prism, the most powerful man in the world. He is high priest and emperor, a man whose power, wit, and charm are all that preserves a tenuous peace. But Prisms never last, and Guile knows exactly how long he has left to live: Five years to achieve five impossible goals. Fourteen-year-old Alex has no idea that he’s descended from the world’s most famous vampire hunter, but that changes fast when he arrives at Glenarvon Academy and confronts two vampires in his first three days. Turns out Glenarvon isn’t the only school near Lake Geneva. Hidden deep underground lies an ancient university for vampires called the Scholomance. And the deadly vampire clan lord known as Icemaker? You might say he’s a visiting professor. When two of Alex’s friends are kidnapped by Icemaker, it’s up to Alex to infiltrate the Scholomance and get them back–alive. Assisted by the Polidorium, a top-secret vampire-hunting organization with buried ties to the Van Helsings, Alex dodges zombies, bullets, and lots–and lots–of fangs on his way to thwarting Icemaker’s plans and fulfilling his family destiny. 1786, Jerusalem College Cambridge. The ghost of Sylvia Whichcote is rumoured to be haunting Jerusalem since disturbed fellow-commoner, Frank Oldershaw, claims to have seen the dead woman prowling the grounds. Desperate to salvage her son’s reputation, Lady Anne Oldershaw employs John Holdsworth to investigate. 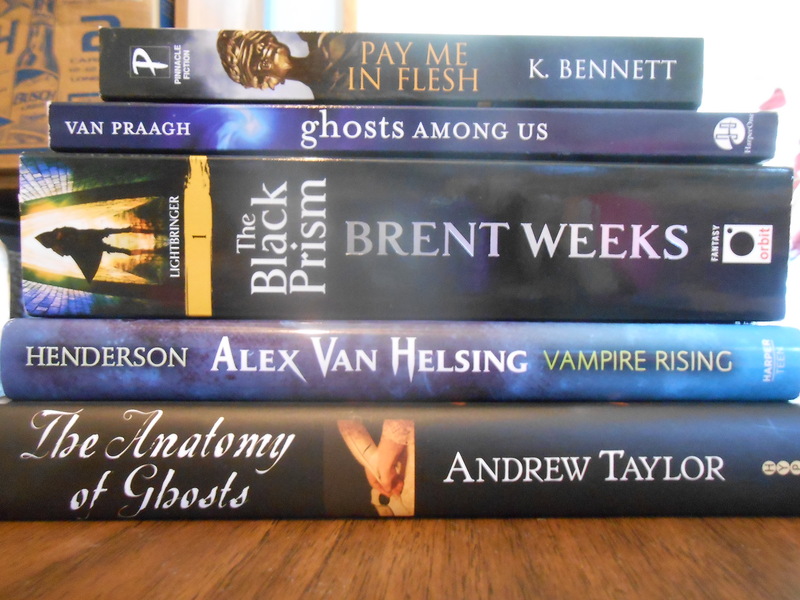 Its a very supernatural themed haul this time, but then, that’s what I lean towards when I’m reading for pleasure (I’ve also been watching quite a bit of Supernatural on Netflix, but that just might be a coincidence). Disclaimer: All books were purchased by myself, for myself, with my personal piggy bank. Hyperlinked book titles all open into new windows to the appropriate Goodreads book page. Supernatural opens in a new window to IMDB, and Neflix opens in a new window to the company website. I am not affiliated with The Dollar Tree in any way. I am not affiliated with IMDB, however I do have accounts on both Goodreads and Netflix. I do not earn any royalties or affiliate earnings if you click on any of the links in this post.